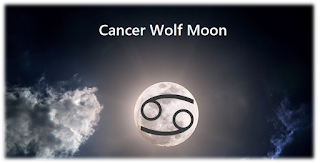 This Full Wolf Moon on January 1, 2018, is in its own sign of Cancer. The energies of the Moon will feel right at home, although they will be somewhat sensitive to the environment and those individuals around them. 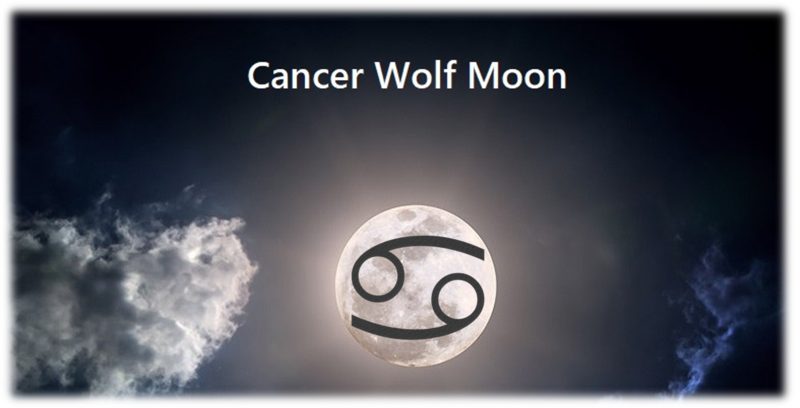 This Full Moon falls at 11 degrees in Cancer. How appropriate as we will be entering into the New Year, and this will be a great time for celebration and a time of enjoyment with family and close friends. Cancer’s energies are perfect for family get-togethers and it would probably work really well if you could celebrate it in your own home. You will need a comfortable place where you feel at home and you can get in touch with those you love. You will find that you may be more sensitive to those around you and anything that seems gruff or intrusive will not sit well with you. If you happen to find yourself in an argument or disruptive situation, you may be inclined to respond deeply and emotionally. You will have a need to be treated in a gentle fashion and also wish to treat others in the same manner. It is best not to allow yourself to go to a place of turbulent emotions. You are too sensitive for this under this influence. You will find that your senses are enhanced as transiting Neptune is in trine to this lunar position. Neptune can be quite sensitive and you may play the martyr to someone in need under this influence or wish to help the needy in your environment. There is a mystical quality linked to this trine and especially so if you have the placement located in the fourth, eighth or twelfth houses in your chart. This Full Moon may go by with little influence for you in particular if you do not have other natal aspects that interact during this influence. Any planet within 3 to 5 degrees of this placement (11 degrees Cancer) will interact and promote energetic and potential spiritual activities in your life. Mars and Jupiter are conjunct in Scorpio and within a couple of degrees of this Full Moon and Neptune. These all together create a Grand Water Trine. This configuration often symbolizes the potential for spiritual, psychic and intuitive experiences. Mars and Jupiter will enhance this experience as Mars brings forth the energy and drive to move forward into these activities while Jupiter brings with it expansion into areas such as philosophy, religion and spiritual practices. If you happen to have a Grand Water Trine in your natal chart which activates this transiting Grand Water Trine, the energies are increased and you might have visions, psychic experiences and dreams relevant to important aspects of your life. Those who are already sensitive may find that their emotional expression enhanced under this influence, and you could be subject to intense emotional experiences even when you don’t really understand what causes them to come to the surface. Follow your gut instinct. Rely on your intuitive understanding and recognize that it might not even be coming from you. This could be a very powerful placement for those with aspects (especially by conjunction) activating this configuration. Remember there has to be natal aspects in force for the experience to be enhanced and active in your life. Look for safety and closeness with those that are near and dear to you. Open up and express yourself. It might be an amazing experience and also enlightening for all those that are open to these energies.